In about the time it takes for you to consider this chart, 18,000 people will have hooked up on Tinder, according to an analysis of things that happen in just 60 seconds online. The stats, which were compiled by Go-Globe.com, were published by Statista as part of the release of the 2018 edition of its Digital Economy Compass today. 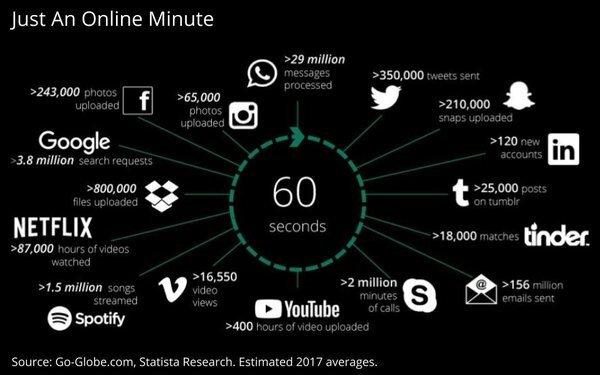 "We had a little fun," admits Statista Data Journalist Dyfed Loesche, conceding that the duration was an arbitrary way to organize the “wealth of interactions that were processed” in snippet of time, in this case, an average digital minute. “It's a quick compendium of things up and downloaded, posted and searched for, sent and received, listened to and watched in bits and bytes,” he explains, summing up today’s essential truth about the value of time in the digital world.